So what's it feel like to be pregnant before the pregnancy sign says it's so? Sorry kids, it feels like it always feels around that *time* of the month. The good news is that you have a sense that you're pregnant. Like you want to howl at the moon or something. 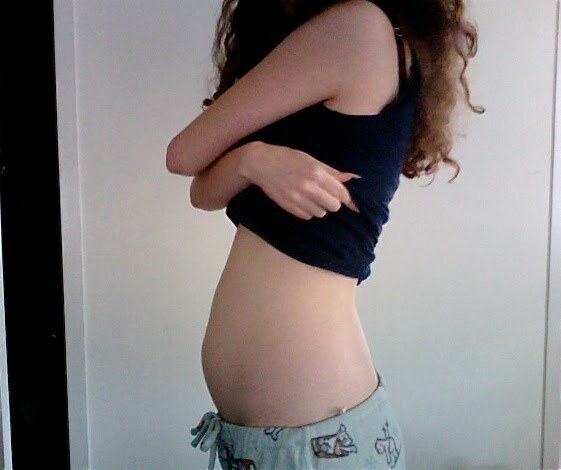 Here's my flat belly at 8 weeks pregnant. That's right, at two months you barely show. Patience! 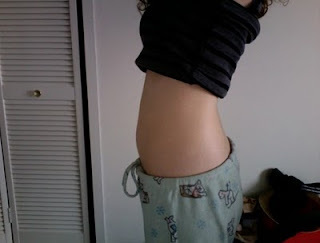 In the next picture, I'm 1o weeks pregnant, cue: MORNING SICKNESS! I remember the first time it struck. I was on a tiny, rickety plane flying from Homer, Alaska to Anchorage, Alaska. I got up to exit the plane and everything became warbled. I thought I was going to vomit and pass out in the aisle. A flight attendant asked if I was all right and I grunted at her. 14 weeks pregnant. Ah, there's the bump. I'm so exhausted, I can barely get out of bed. I feel nauseous all day long. The doctor says I'm a little slow to gain weight. Food aversions? Corn. Yuck, disgusting. All things barbecue, gross. 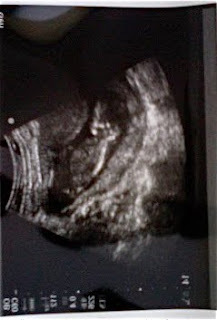 Below, you'll see my baby at 14 weeks 5 days. We don't know if it's a girl or a boy. 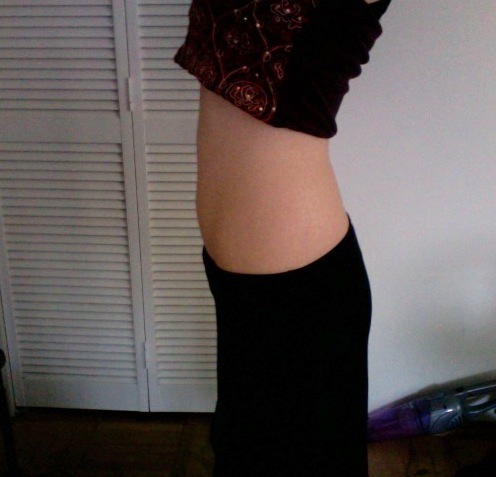 16 weeks pregnant. 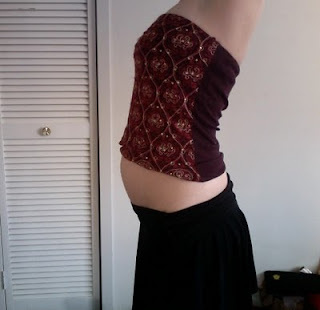 Time to put the belly shirts away! Er, wait I don't wear belly shirts. More like, time to buy maternity clothes, ya cheap lazy loaf! *** Also, a note to all the fashion princes and princesses out there: I wear like, the same clothes over and over again. Yeah, I said it. I was all about the comfort, my friends. Don't hate cuz my skiing bear pajama pants make you want to raid my closet.